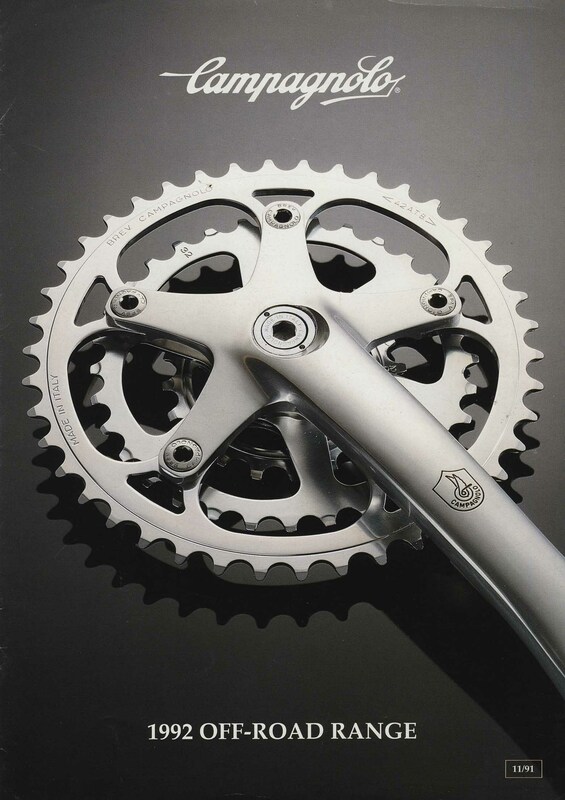 This catalogue dates from November 1991 and describes the Campagnolo range for model year 1992. This was a time of booming mountain bike sales - but Campagnolo was struggling to get into the game. Record OR (for Off Road) is introduced at the very top of the range. The Record OR derailleur has the new Record design with a hidden bolt at the p-pivot. It is shown with a style of cable clamp bolt that I have never seen in reality. Icarus replaces Euclid. Icarus derailleurs are similar to Euclid, but with a brass insert at the cable adjuster and without an spring tension adjustment screw at the p-pivot. Centaur moves down market, losing its spring tension adjustment screw at the p-pivot and gaining steel parallelogram plates. I have never seen this version of Centaur in the flesh. Olympus and Themis are killed off. All fancy graphite colour options are binned.